Trees for Troops®, a program of the Christmas SPIRIT Foundation, provides free, farm-grown Christmas Trees to United States armed forces members in all branches of the military and their families, through donations, sponsorships, grants and the work of many volunteers. Many members of the Maine Christmas Tree Association support the Trees for Troops program by donating Christmas trees, donating money, or collecting donations from customers at their retail lots for the program. In addition, members of MCTA collect and create ornaments each year to send with the Maine trees donated to Trees for Troops. Since 2005, more than 191,000 free, farm-grown Christmas Trees have been provided to troops and military families in the United States and overseas through Trees for Troops. Thousands of trees are donated by American farm families and the public, and FedEx delivers these trees to more than 63 military bases in the U.S. and overseas. 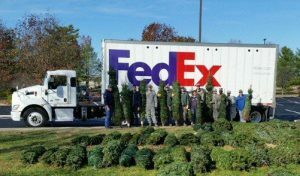 FedEx has logged more than 700,000 ground miles for the Trees for Troops program. In 2016, Trees for Troops delivered 17,141 farm-grown Christmas Trees. Trees were donated by roughly 450 Christmas Tree growers, retailers and their customers in 25 states. Donations were received through individual farms, the collective efforts of state and regional Christmas Tree associations, and Trees for Troops weekend. Hundreds of donors and volunteers participate each year to make Trees for Troops happen. The Christmas SPIRIT Foundation was awarded the Best in America Seal of Excellence. The Independent Charities Seal of Excellence is awarded to charities that have been able to certify, document, and demonstrate on an annual basis that they meet the highest standards of public accountability, program effectiveness, and cost effectiveness. It is estimated that fewer than 5 percent meet or exceed these standards, and, of those, fewer than 4 percent have been awarded this seal. In 2009, CSF received a Halo Award from the Cause Marketing Forum for the implementation of the Trees for Troops program. This award recognizes outstanding cause marketing campaigns, which is an alliance between a non-profit and a corporate entity who join together for a cause.